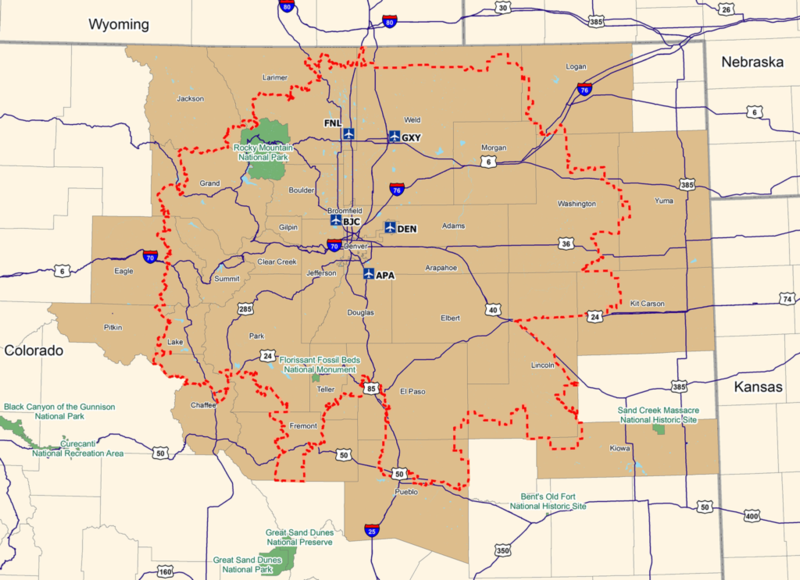 April 8, 2019 – The Federal Aviation Administration (FAA) will hold 12 public workshops between April 29, 2019 and May 16, 2019 in and around Denver about proposed airspace improvements over the metropolitan area. As part of this review, the FAA will hold 12 public workshops at multiple locations around the Denver Metro area. The workshop dates will be Monday through Thursday over a three-week period: April 29-May 2; May 6-9; and May 13-16.The workshops will take place from 5 p.m. to 7:30 p.m., and will be an open-house format, where people can attend any time during the posted times to learn about the project. They will take place in the following areas: Aurora, Brighton, Broomfield, Boulder, two in the Centennial area, Denver, Erie, Green Valley Ranch, Greenwood Village, Longmont and Parker. The FAA will announce the workshop locations when the agency releases the project’s Draft EA. People can submit written comments on the Draft EA at the workshops and online during a 45-day public comment period that will run from April 22, 2019 through June 6, 2019.The FAA will consider all applicable comments we receive.